A few years ago I decided that I wanted to devote my life to backpacking. I didn't want to work some nine-to-five, and squeeze backpacking trips in whenever I could. I wanted to backpack full time... But the more I worked toward that goal, the more I realized how difficult it would be. Everyday I read about people thru-hiking the long trails every year, and I wonder, "How do they do it?" How do people afford spending half the year on the trail? What becomes of their home life? What do they go back to? It was easy for me to give up most of my possessions when I decided that I no longer wanted to be controlled by them. That was the easy part. My last apartment I was afraid to sign a year lease. I was afraid to be tied down, to be contractually obligated to one place for a year. I kept thinking that having a lease would hold me back from what I really wanted to do... Hesitantly I relented, and signed the year lease... and moved to Arizona 6 months later. Until I can find a way to support my family doing what I love, I will remain what I have always been, a weekend warrior. Backpacking on the weekends has taken me on some epic adventures to some amazing places. To me, backpacking is about seeing and being in those special places, and I feel like they are all a part of me now. Being a weekend warrior does not make me less of a backpacker, though sometimes I feel that way when I read about guys like Barefoot Jake or The Hiking Dude, who's adventures seemingly follow one after the other. Sometimes I feel that way because of this sort of backpacker elitism attitude I've encountered from other bloggers, or on certain forums, or even from some comments people have left me on my own blog. Man, I can't really grasp that kind of useless negativity, because In my world there's no time for it. It's perfectly fine if your pack weighs 30 pounds, or if you prefer boots over shoes, or if you use a free-standing tent instead of a tarp. There isn't anything wrong with filtering your water or using a canister stove. And if you only hiked 5 miles in one day then I say more power to ya, because it's not about speed, its about being there, and soaking in the grandeur, and embracing that peace of mind that you only get from being in the woods. I long for the days when I can backpack the long trails. When I can spend weeks, even moths, at a time in the woods. The call of the wild is too strong in me for that not to happen eventually... For now, I'm proud to call myself a weekend warrior. 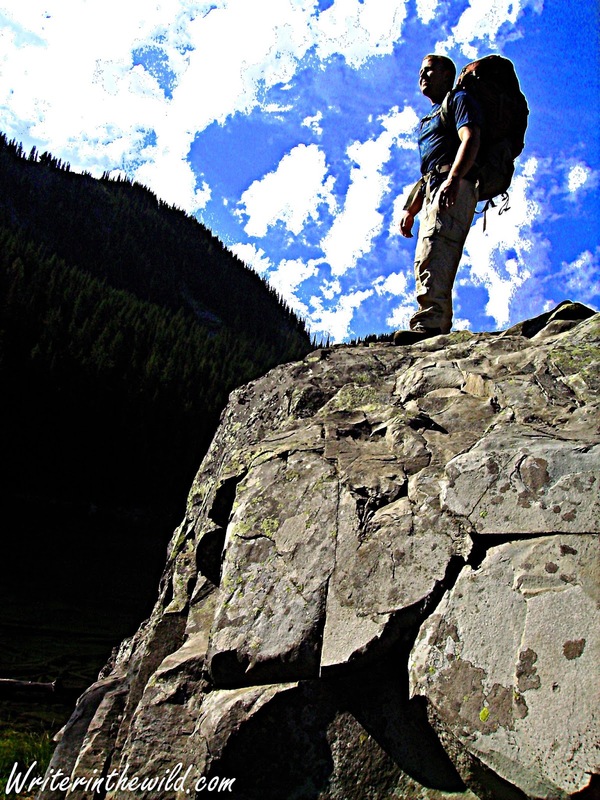 My cousin Luke at Revett Lake in north Idaho.